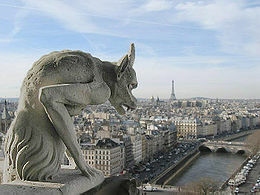 Gargoyles looking over cities in France. Demonically Beautiful. A gargoyle is a carved stone grotesque. There are various carved sculptures of gargoyles. Stone carved gargoyles in the shape of lion, dog, wolf, eagle, snake, goat, and monkey are among many that adorn buildings. Mainly designed with a spout to convey water from a roof and away from the side of a building. Preventing rainwater from running down masonry walls is important because running water erodes the mortar between the stone blocks. Architects often used large and multiple gargoyles on buildings to divide the flow of rainwater off the roof to minimize the potential damage from erosions caused by rainstorms. Gargoyles are usually stone carved into large elongated animals. A gargoyle's length determines how far water is thrown from the wall and away from the stone buildings. Gargoyles are said to scare off and protect from evil and harmful spirits. Gargoyle originates from the French word "gargouille" which means throat or gullet.A French legend by the name of St. Romanus (Romain - AD 631 - 641), a former chancellor of the Merovingian king Clotaire II who was made bishop of Rouen, recounted how he saved the country around Rouen from a monster called Gargouille or Goji. La Gargouille is said to have been the typical dragon with batlike wings, a long neck, and the ability to breathe fire from its mouth. There are a few versions of the story that St. Romanus subdued the creature with a crucifix, or he captured the creature with the help of the only volunteer, a condemned man. The monster is taken back to Rouen and burned but its head and neck would not burn due to being tempered by its own fire breath. The head was then mounted on the walls of the newly built church to scare off evil spirits, and used for protection. In commemoration of St. Romain the Archbishops of Rouen were granted the right to set a prisoner free on the day that the reliquary of the saint was carried in procession. (see Rouen for details). 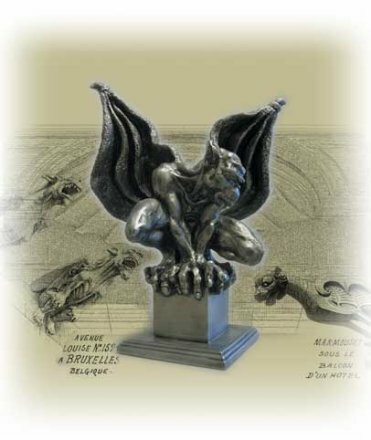 The term gargoyle originates from the French word "gargouille" which means throat or gullet. Latin word "gurgulio", "gula", "gargula" and Spanish word "garganta" and "gargola" which also means throat and are derived from the root word "gar" which means "to swallow" and represents the gurgling sound of water. It is also connected to the French verb "gargariser", which means "to gargle". 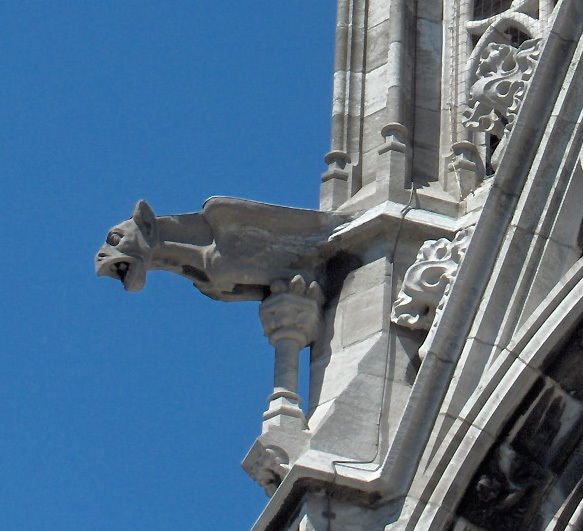 Gargoyles were viewed two ways by the church throughout history. Often gargoyles were used to assist the Church in conveying messages to the common people. Due to literacy being uncommon, images were the best way to constantly convey ideas. 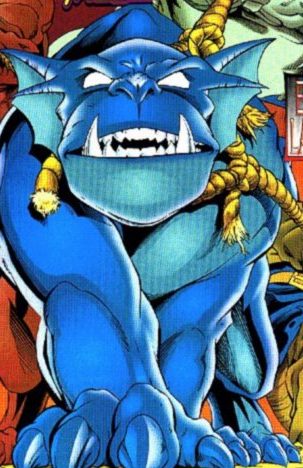 Gargoyles were used as a representation of evil. It is thought that they were used to scare people into coming to church, reminding them that the end of days is near. It is also thought that their presence assured congregants that evil is kept outside of the church's walls. However, some medieval clergy viewed gargoyles as a form of idolatry. In the 12th century a church leader named St. Bernard of Clairvaux was famous for speaking out against gargoyles. 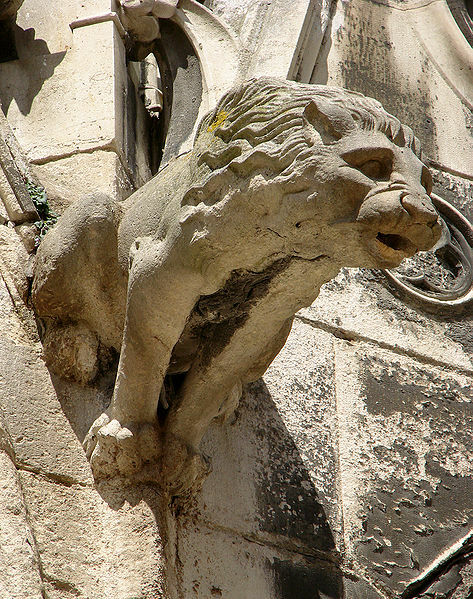 Although not designed to drain water and therefore technically not gargoyles, the grotesques on modern structures are still considered by most people to be gargoyles. Grotesques were used as decoration on 19th- and early 20th-century buildings in cities such as New York, Minneapolis, and Chicago. Gargoyles can be found on many churches and other buildings. Gotham City crime fighters by night.